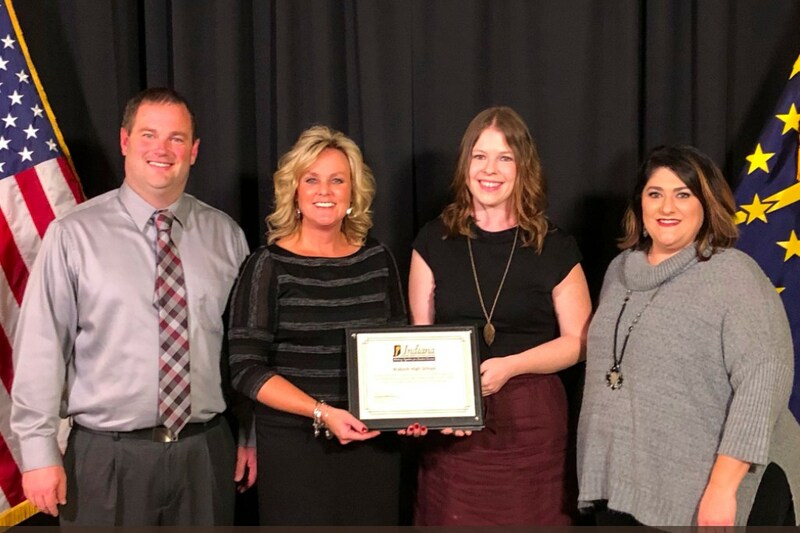 On Monday, November 6, Wabash High School received recognition from the Indiana Department of Education for over 30 percent of the entire student body receiving dual credit during the 2015-2016 school year. Wabash High School Principal Kyle Wieland and Wabash High School English teachers Lauren Millspaugh and Erin Sapusek attended the recognition ceremony at the Capitol. Receiving the commendation from State Superintendent Dr. Jennifer McCormick, Mr. Wieland focused his pride: "We are very excited about this award. Wabash High School is focused on creating as many college and career opportunities for our students and this recognition is a nice public acknowledgement of these efforts. I wish my entire faculty and student body could be with us today because this award is really about opportunities created by our teachers and the willingness of our students to seize those opportunities. I look for the percentage of students earning dual credit to only increase in years to come." Wabash High School was endorsed as one of 19 high schools in the state of Indiana as an Early College High School. Early colleges focus on building a supportive college going culture for students in a concentrated pathway. Wabash University High School students can earn a 30 credit hour general education core certificate transferrable to any Indiana state college or university. This certificate transfers 1 year of coursework. Wabash High School students earn college credit through Vincennes University, Ivy Tech Community College, IPFW, Manchester University and Indiana University Kokomo. For the 2015-2016 school year, 38 percent of Wabash High School students earned dual credit, with over 50 percent of the senior class earning some type of dual credit. Beginning this school year, over 50 percent of the entire student body are on track to earn dual credit.